RPM International Inc.’s RPM cost-saving initiatives, continued focus on acquisitions and robust industrial segment performance are major factors driving growth. However, increased raw material costs and adverse weather conditions remain concerns. Notably, shares of this Zacks Rank #3 (Hold) company have outperformed its industry in the past year. Its shares have gained 23% compared with its industry’s rally of 9.4% in the said period. RPM’s continued focus on strategic acquisitions is likely to drive growth over the long haul. Acquisitions and cost-effective strategies help the company to expand its product coverage. In March 2018, RPM acquired Miracle Sealants Company through its Rust-Oleum business group, adding another platform within Rust-Oleum’s hard surface care product portfolio. Total acquisitions added 3% to net sales in fiscal 2018. Also, the company acquired Whink Products, a specialty cleaners manufacturer and marketer, through its Rust-Oleum business group last December. The Whink acquisition will accelerate the company’s expansion into other indoor cleaning solutions. The company is on track to pursue more takeovers. RPM has been undertaking initiatives to reduce costs by closing plants, merging IT system, centralizing more of its back-office functions and rationalizing its manufacturing footprint. During the first quarter of 2019, the company reduced more than 150 positions, mainly in the Industrial and Specialty segments, and announced the closure of four manufacturing facilities. Also, the company aims to realign some of its global brands and make changes to its leadership structure. These cost-saving efforts are expected to improve operating margin significantly. Additionally, it’s industrial segment (comprising more than 50% of total sales) acts as a key catalyst for overall growth. The segment has been reporting impressive numbers over the past few quarters. In first-quarter fiscal 2019, the segment’s sales increased 7.2% on strong performance in North American waterproofing along with a healthy recovery in businesses serving the oil and gas sector. In fiscal 2019, sales at the Industrial segment are expected to grow in the mid single-digit range. Rising raw material costs, particularly in certain categories like epoxies and silicones, are a major threat to the company. RPM expects the challenging raw material environment to persist, thereby creating pressure on gross margin. In fact, in first-quarter fiscal 2019, gross margin of 40.6% declined 190 basis points year over year owing to a rise in raw material costs. Moreover, demand for paint, coatings, roofing and construction productshighly depends on weather conditions, which in turn affect the company’s top line. In fact, extreme cold and rainy weather, especially during the general construction and exterior painting season, could have an adverse effect on the sale of such products. Historically, the company faces weaker sales and net income in the fiscal third quarter (December through February) compared to other quarters. 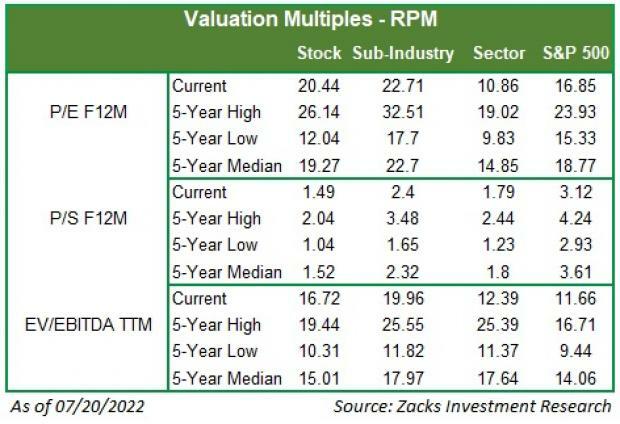 A few better-ranked stocks in the Construction sector are KBR, Inc. KBR, EMCOR Group, Inc. EME and Dycom Industries, Inc. DY, each carrying a Zacks Rank #2 (Buy). You can see the complete list of today’s Zacks #1 Rank (Strong Buy) stocks here. EMCOR Group has an expected earnings growth rate for the current year of 19.9%.